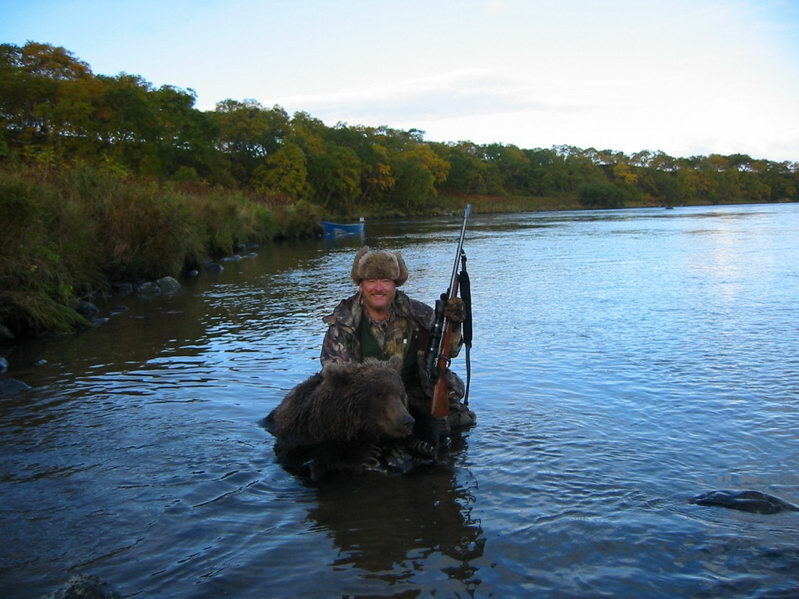 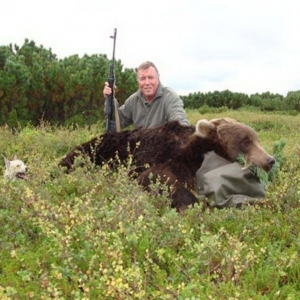 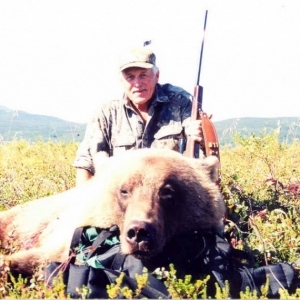 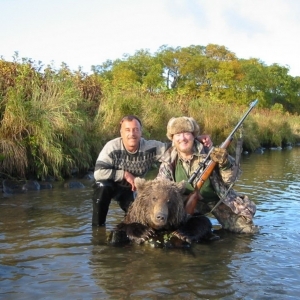 How does the bear hunting in Kamchatka in autumn pass? 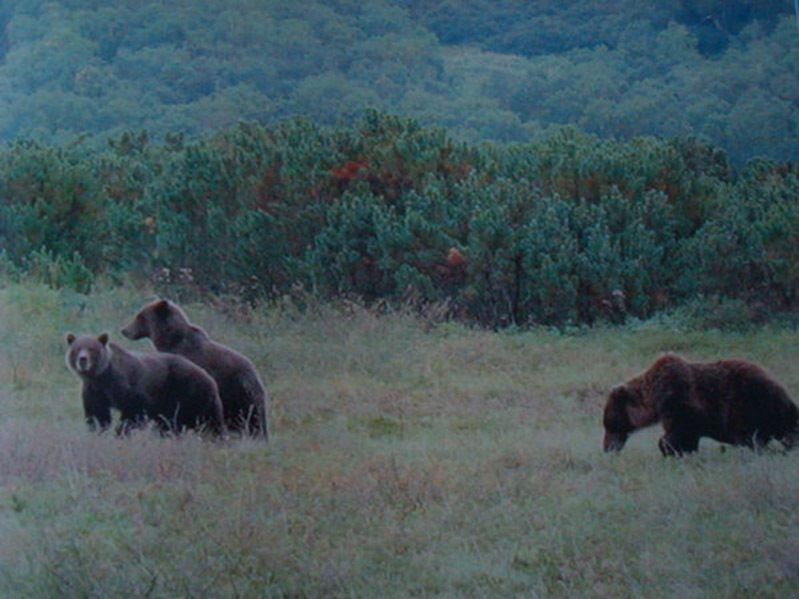 To order a tour fill out the form, we’ll contact you real soon! 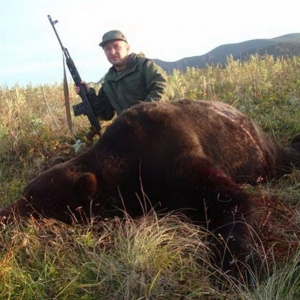 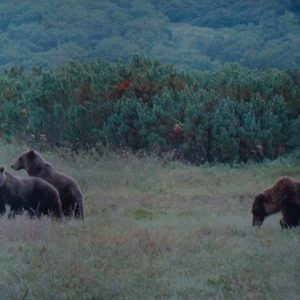 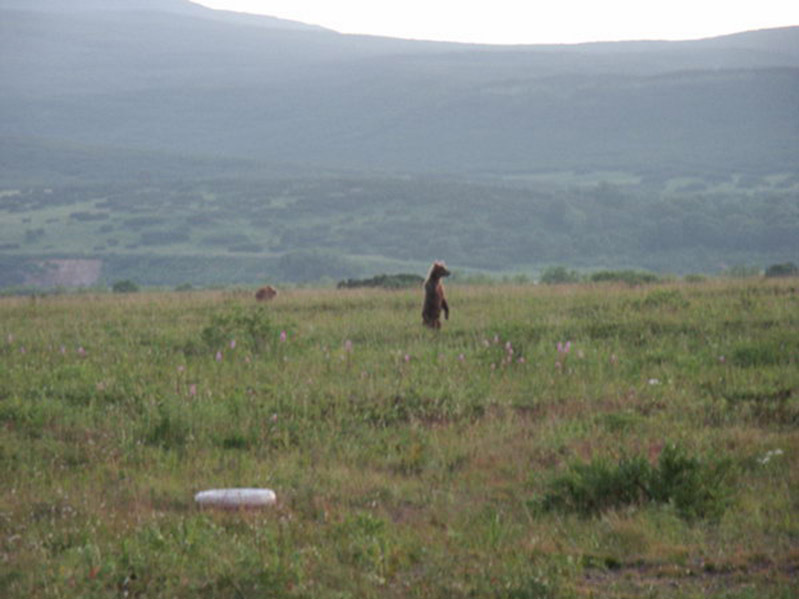 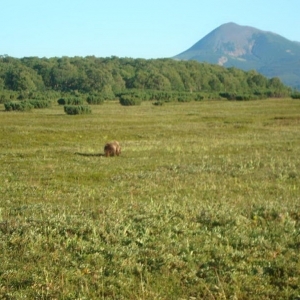 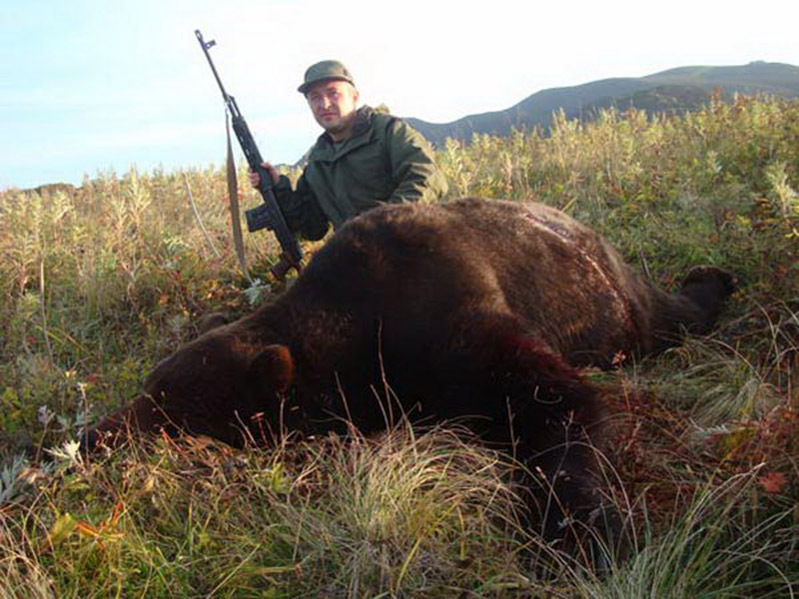 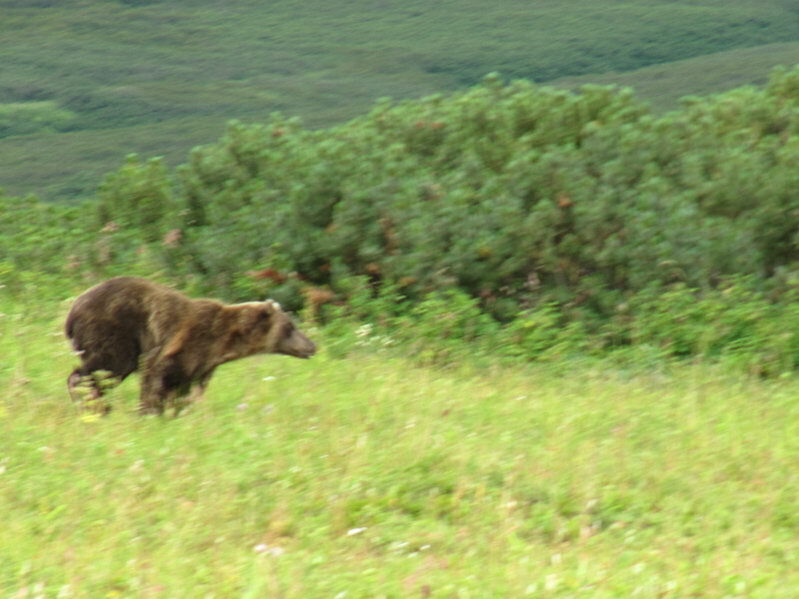 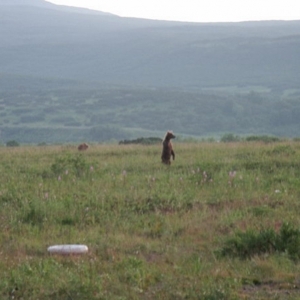 Fall Bear hunting in Kamchatka lasts since Aug 20th till Dec 1st. 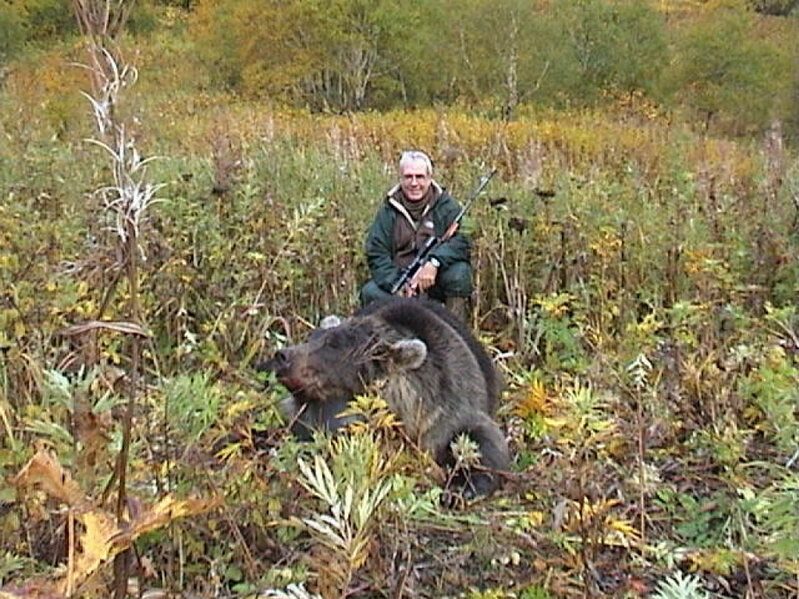 Our company’s limit for this hunt is 10 trophy licenses. 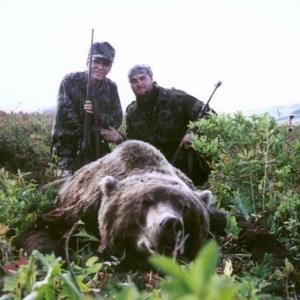 Due to longer official period of hunting time there are no strict tour dates for spring hunt. 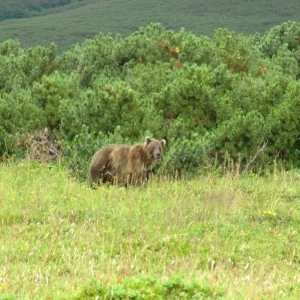 It depends on You when to start and finish but from our experience and due to specific local conditions, we say most favorite period is since Aug 20th till Oct 15th. 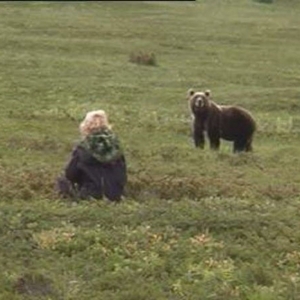 How do we get you to the camp? 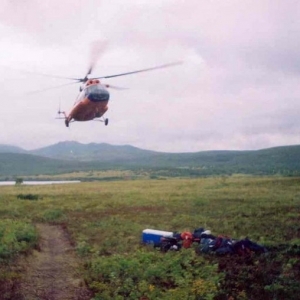 One of our local rep’ persons meet our guests upon landing at the airport in Elizovo (PKC IATA code), and upon finishing all due procedures they leave to the camp by helicopter. 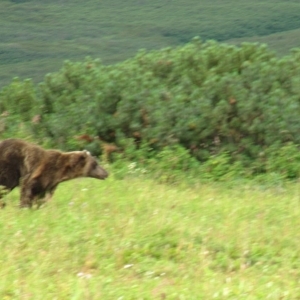 Flight takes 1 hour approx. 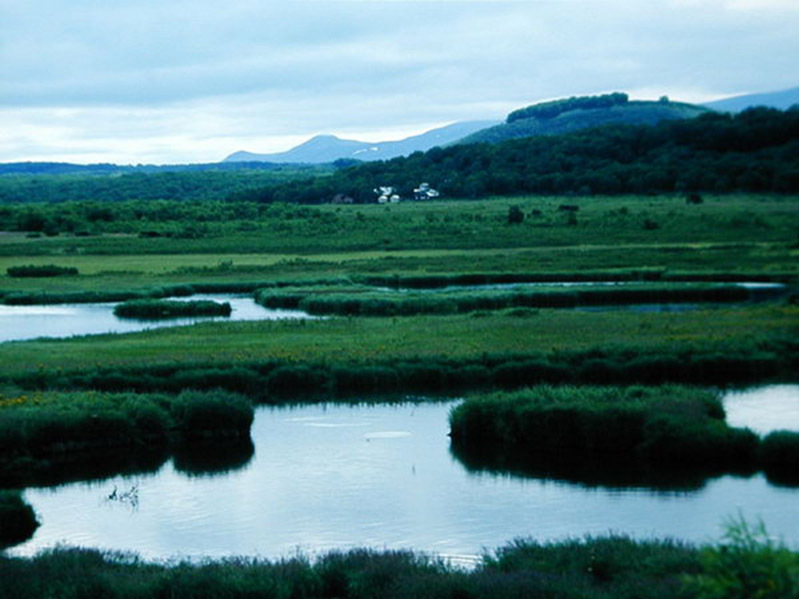 In case the weather conditions do not allow flying, our customers are accommodated in the hotel until weather change. 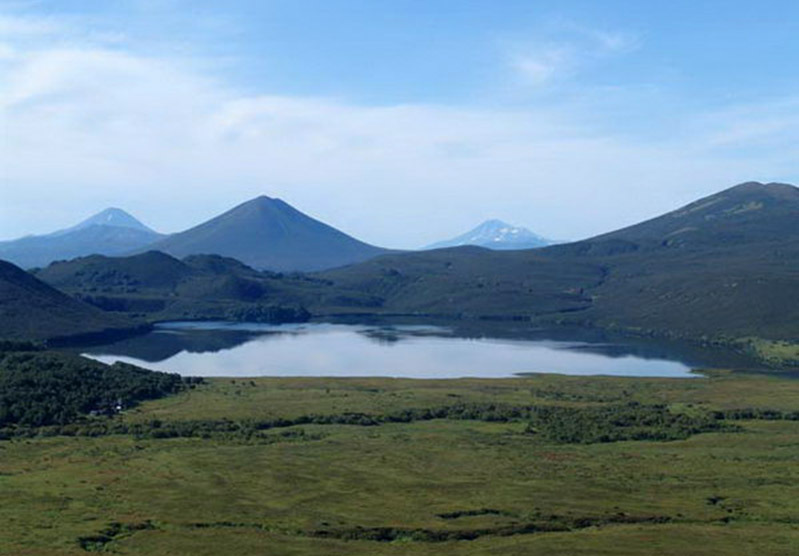 In that case they could spend some time sightseeing, purchasing souvenirs (which are btw a few times cheaper when back in US) and for sure enjoying our great Kamchatka cuisine. 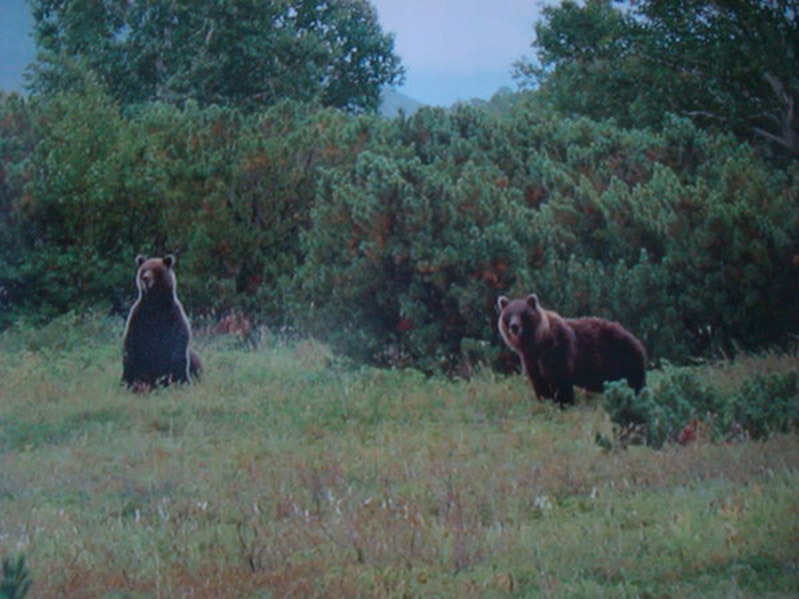 Also they can visit our famous thermal springs to get travel dirt of their shoulders. 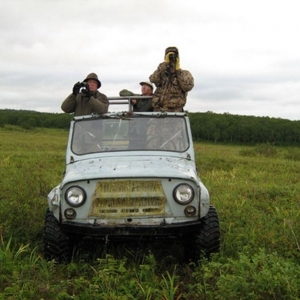 At the camp, the hunters get safety instructions, explanations about the way of hunting, get acquainted with local huntsmen. 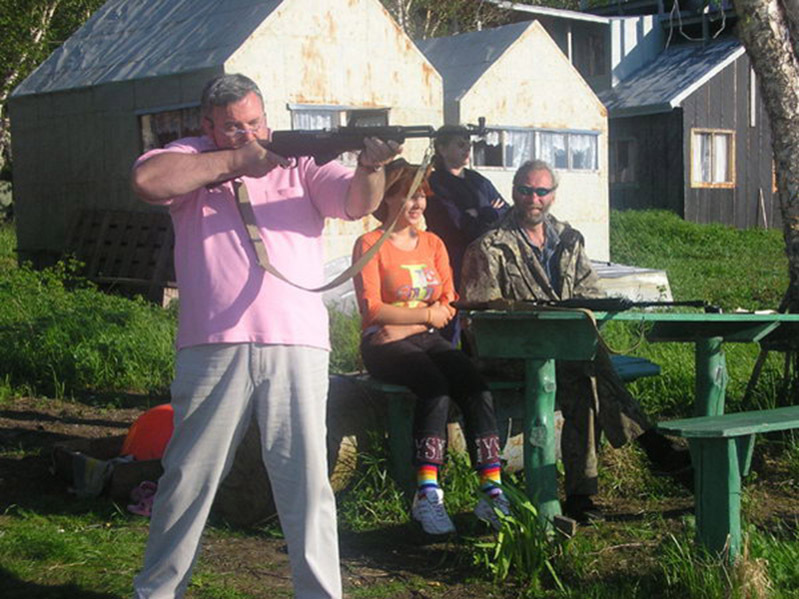 All this combined with preparations of the equipment, test shooting, etc. 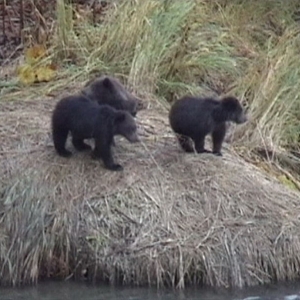 During the hunt, one our guide accompanies two hunters. 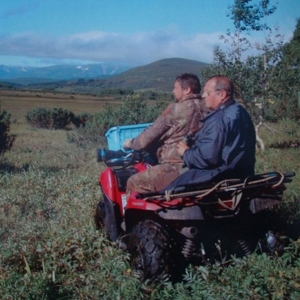 Hunting is performed with reliable off-road vehicles. 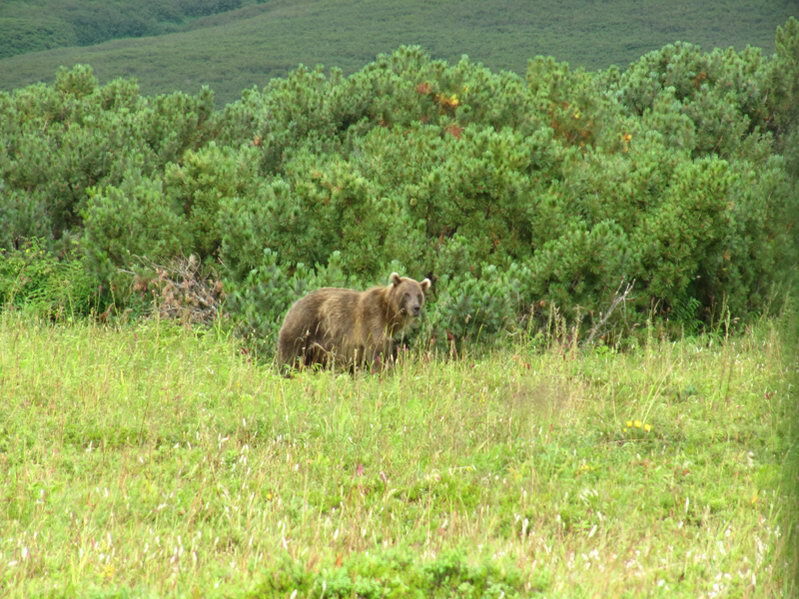 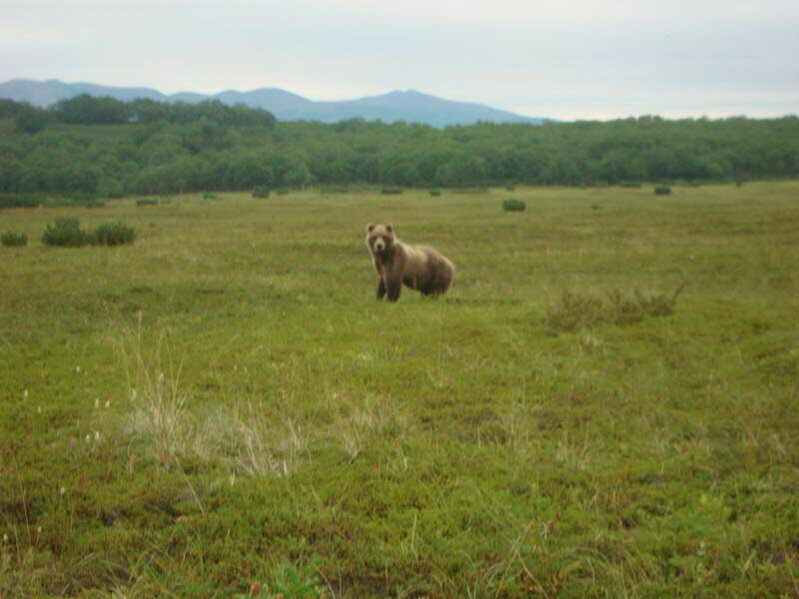 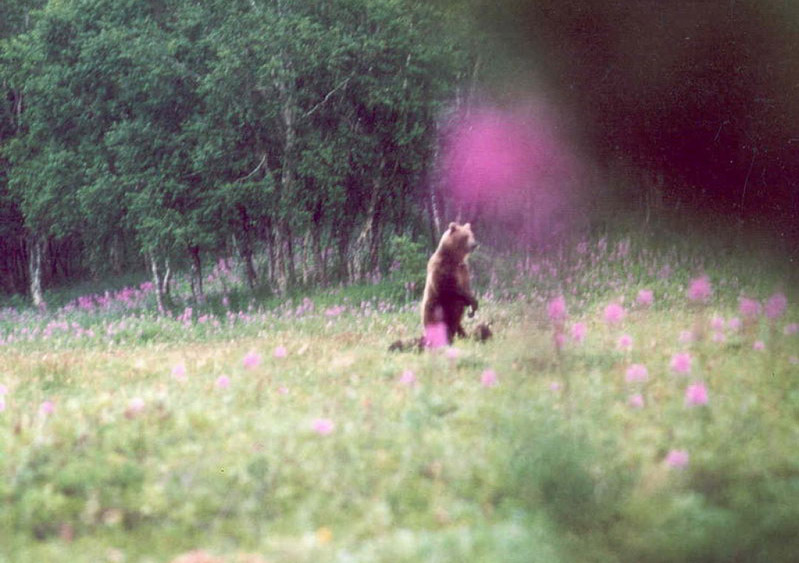 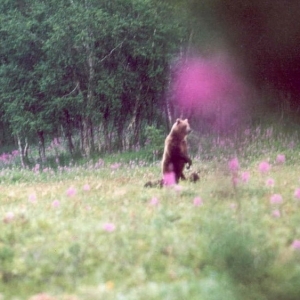 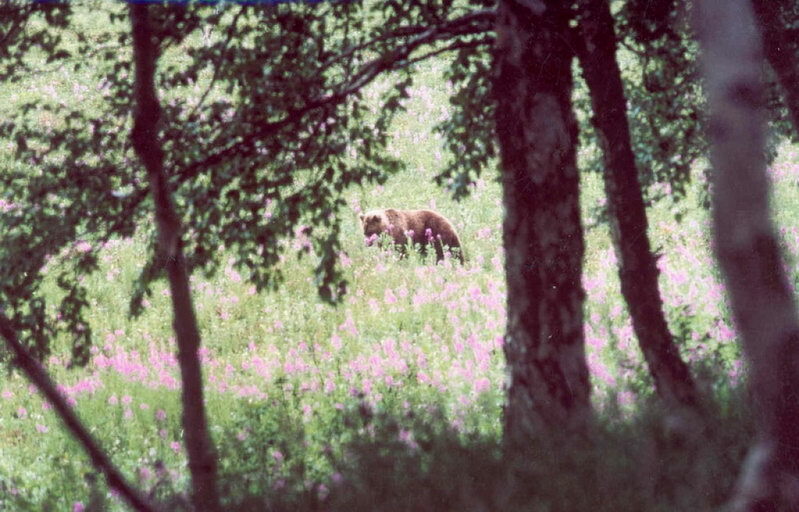 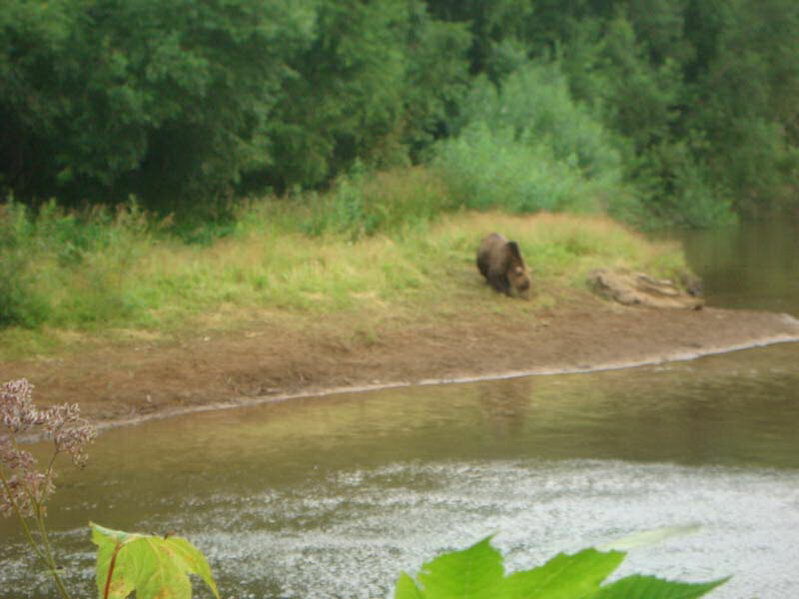 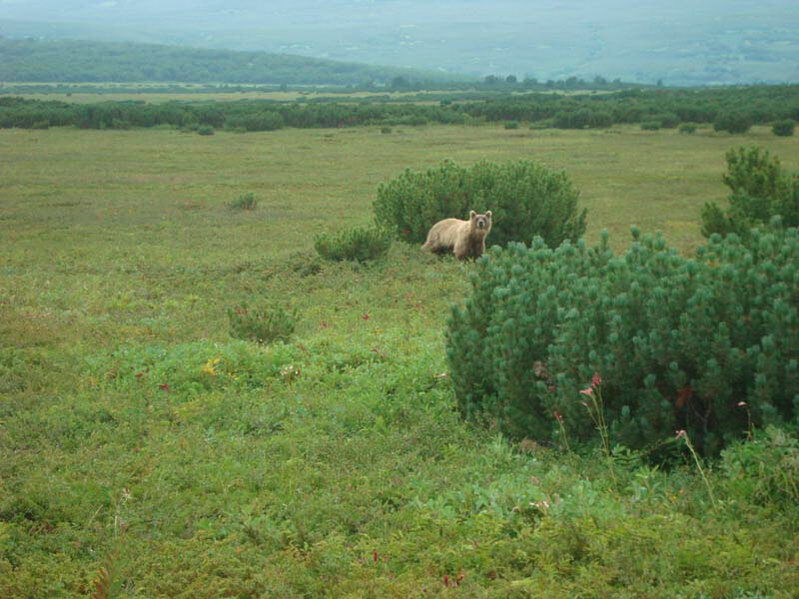 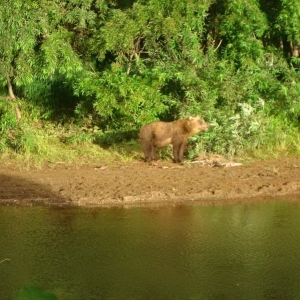 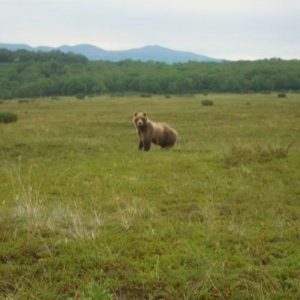 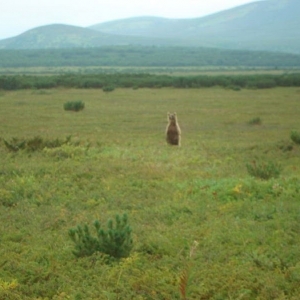 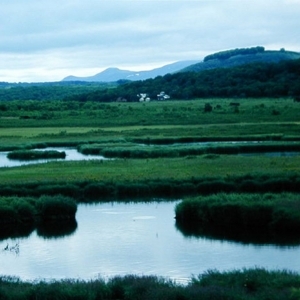 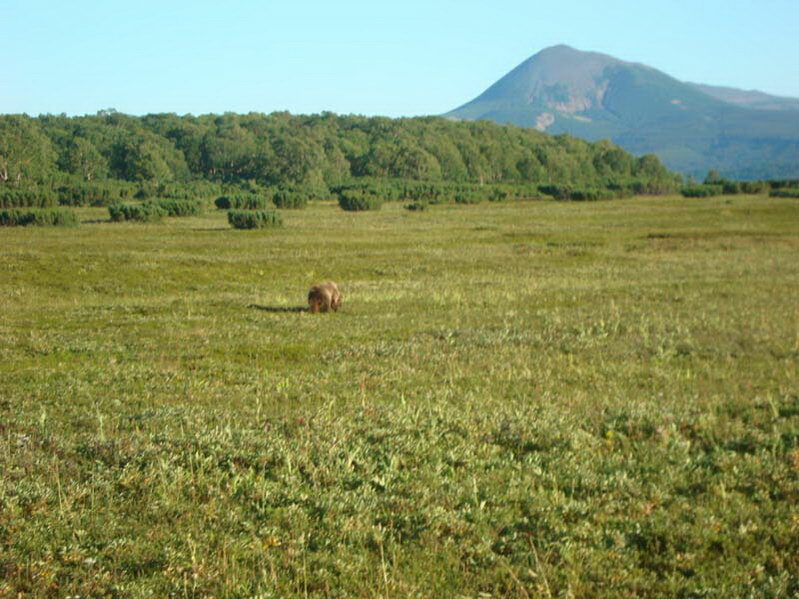 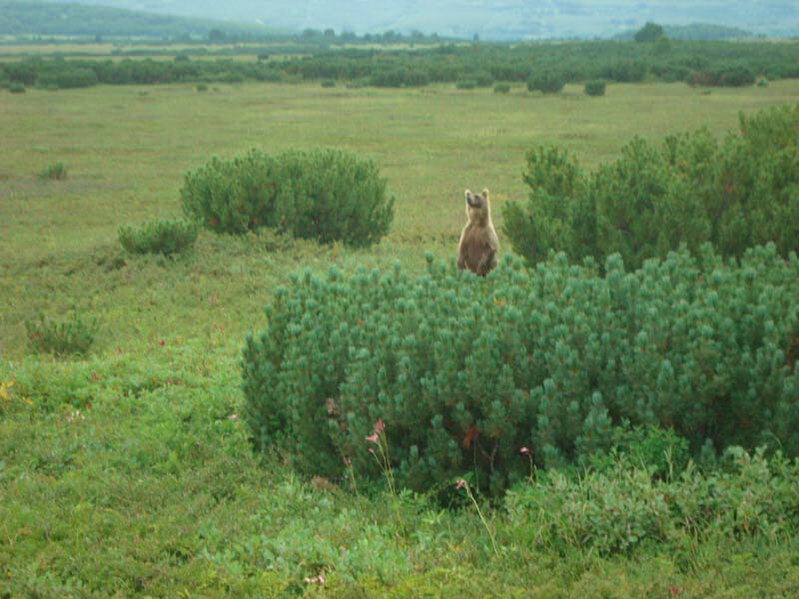 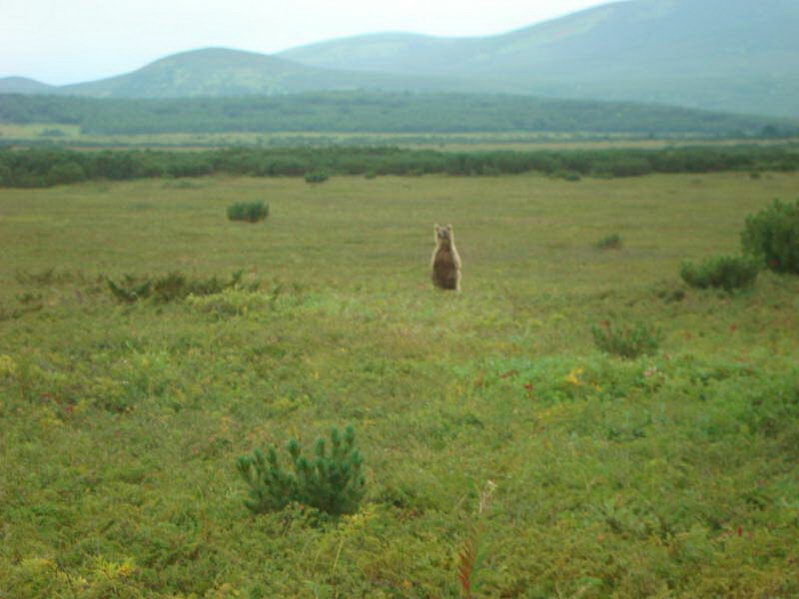 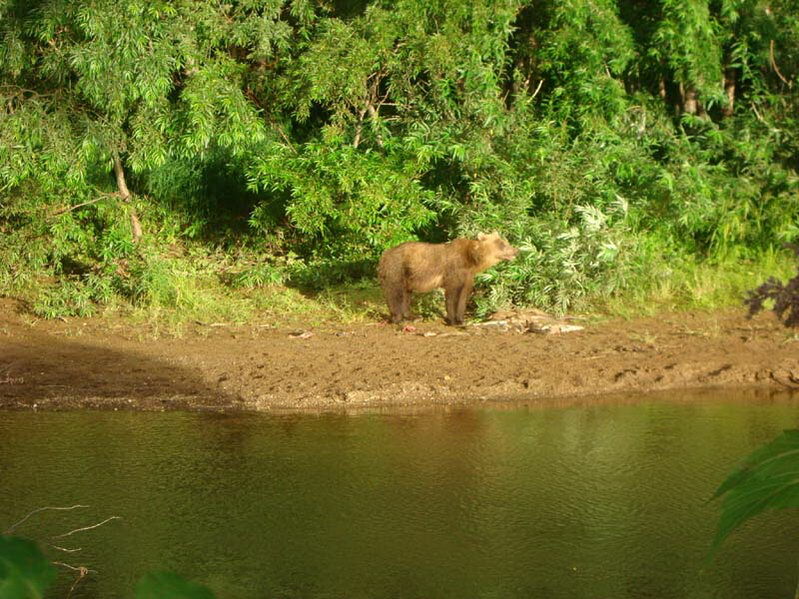 During fall season Kamchatka bears are dispersed along the rivers costs or near the berry tundra bushes. 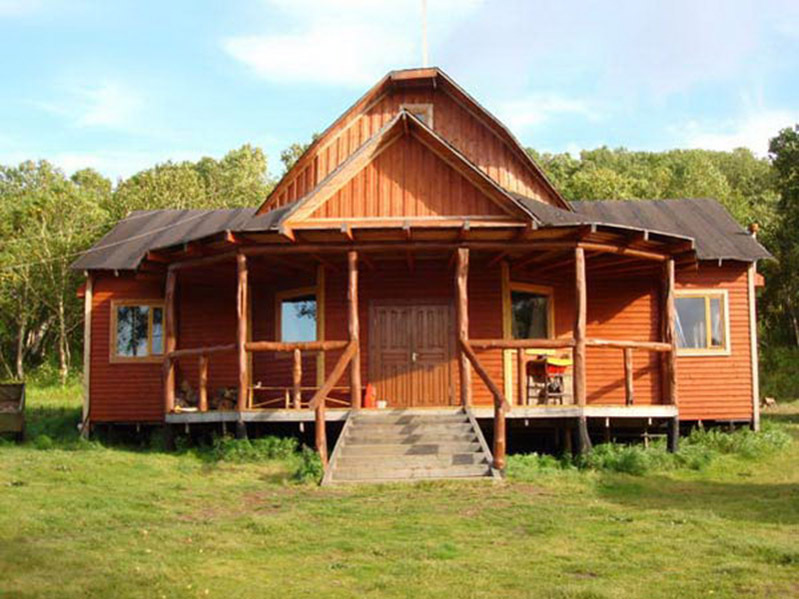 In case of long-drawn pursue there is an option of spending a night in tents specially placed on the borders of the ranch to prevent night return. 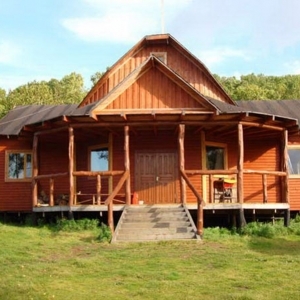 The huts got stove heating, so are warm and cozy. 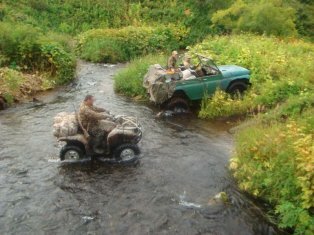 All of your trophies are delivered to the camp by off-road vehicles and ATVs. 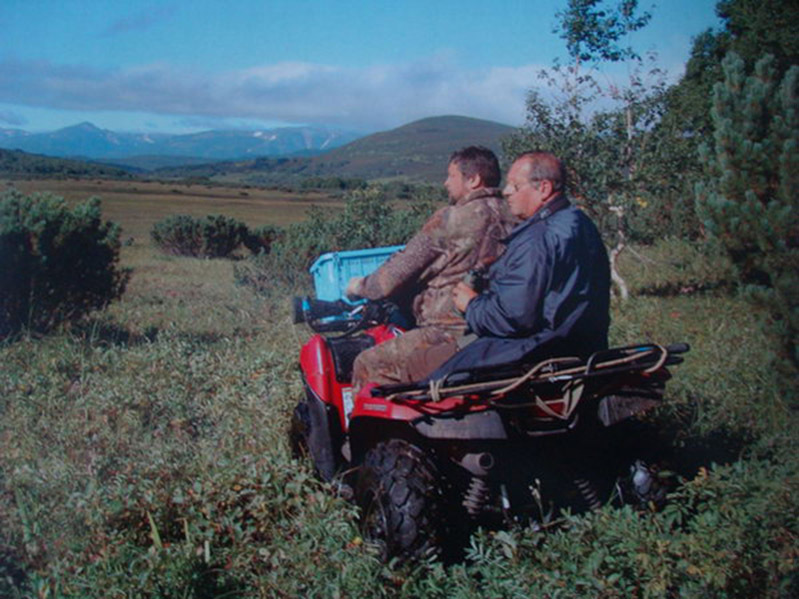 Warm, light wind and waterproof outerwear (Gore-Tex better) – a jacket, pants. 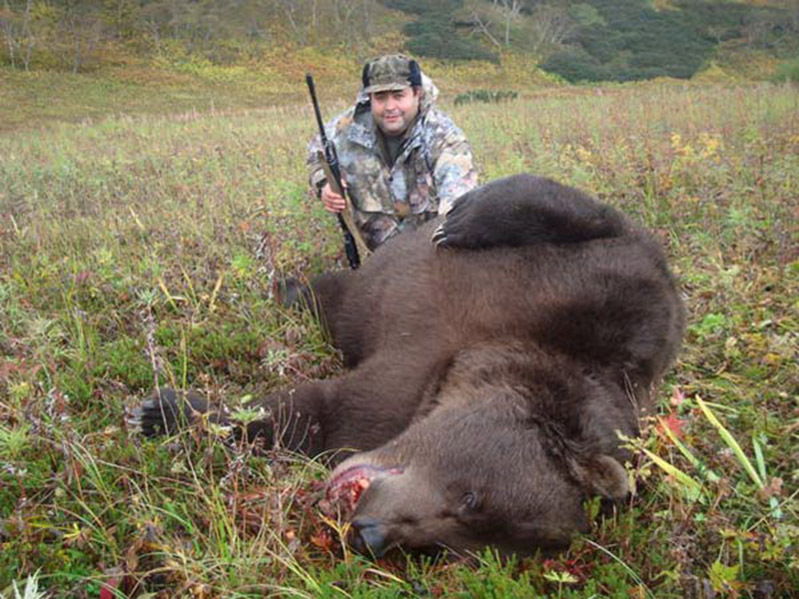 Hunting baseball cap with a big peak. 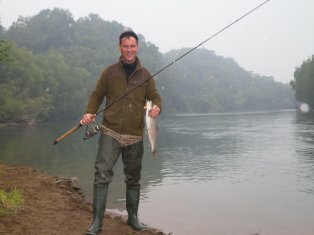 Anti-mosquito net, bloodsucking insect repellent. 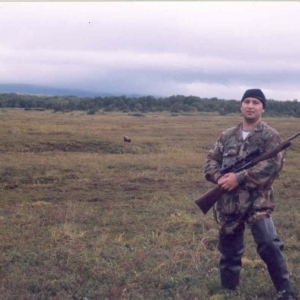 Soft rifle cover (if a hunter brings his own rifle). 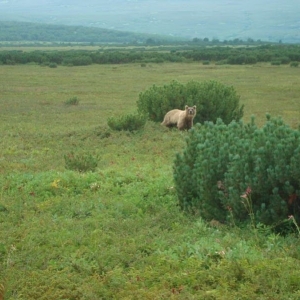 Meeting at the airport Elizovo PKC. 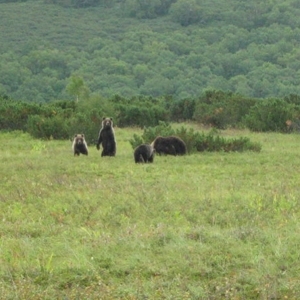 A guide, an interpreter, a cook, and a camp worker. 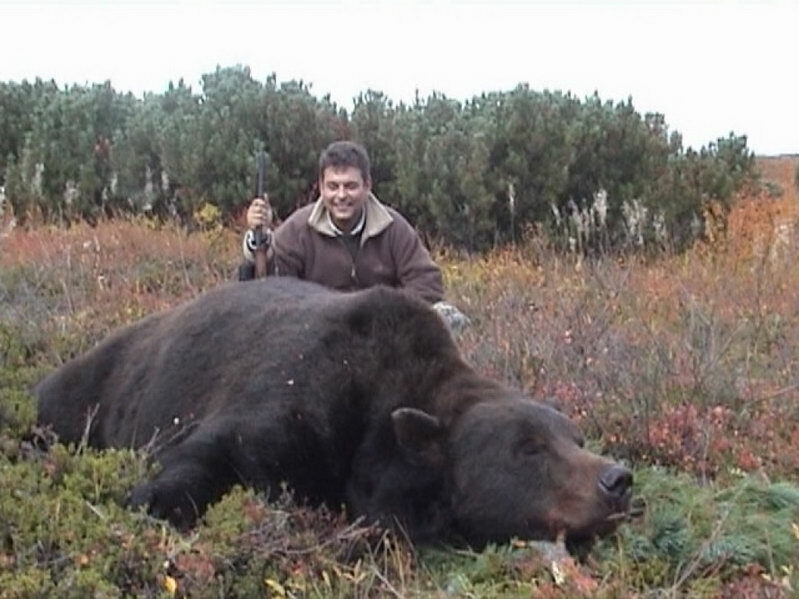 A standard veterinary certificate for a trophy transportation. 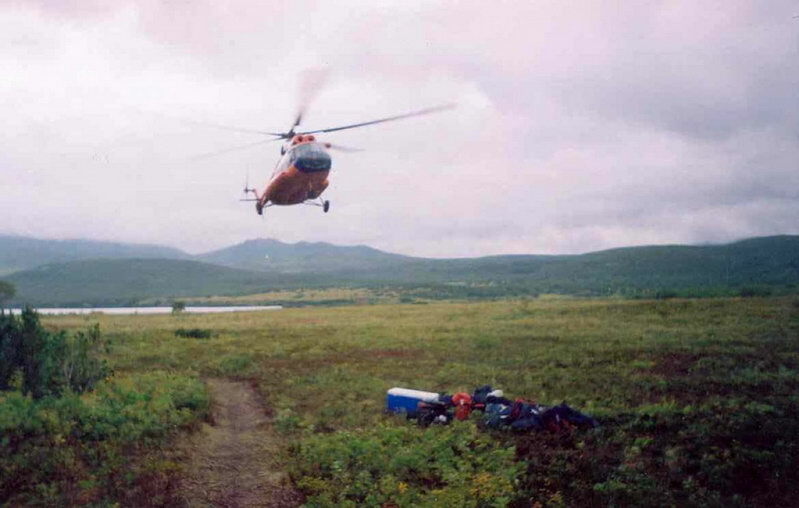 Additional booking of Mi-2 helicopter (for flying around excursion). 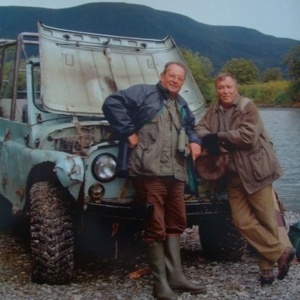 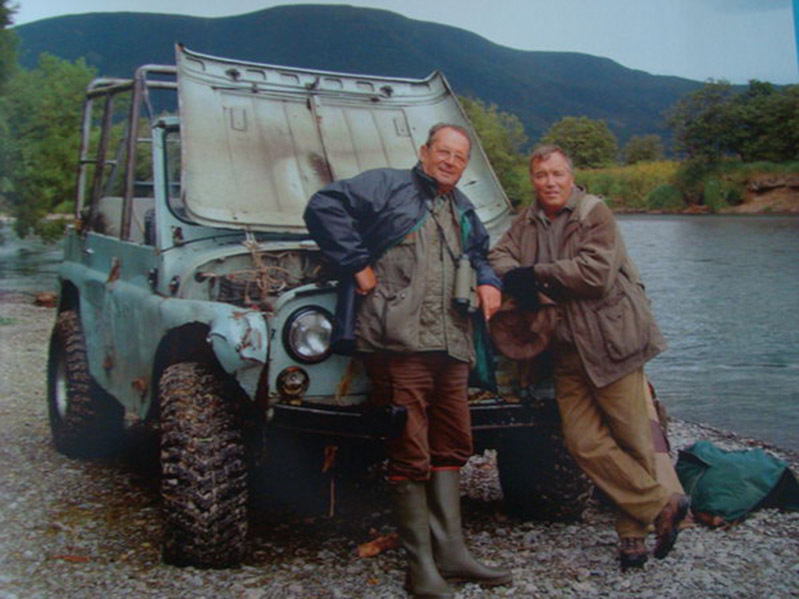 Two Japanese ATVs – Kawasaki – 750 and Yamaha Grizzly 650 — and two UAZ-469 with all-terrain tires are used for travelling across the hunting ground. 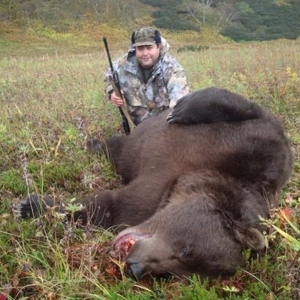 Our company applies several fall bear hunting methods. 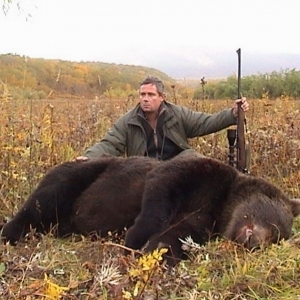 A trophy is considered a bear of three years old and older, weighing from 150 kg and more. 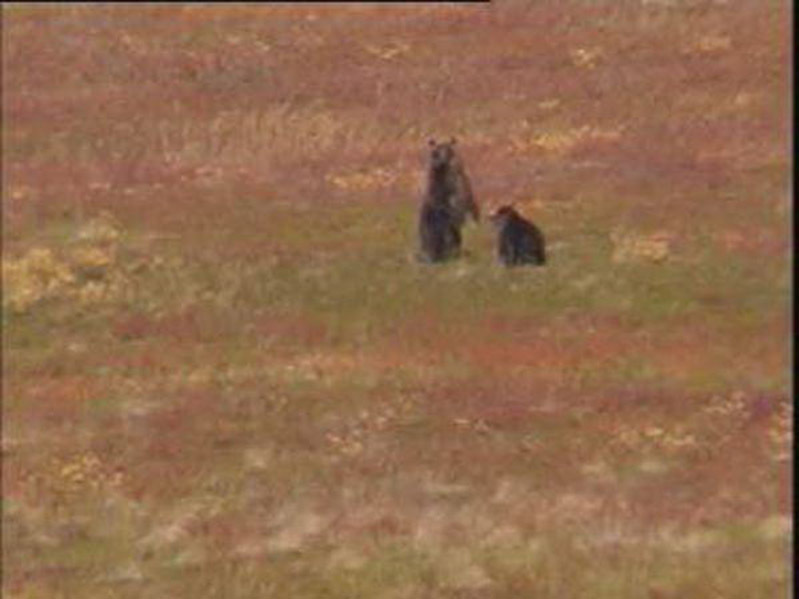 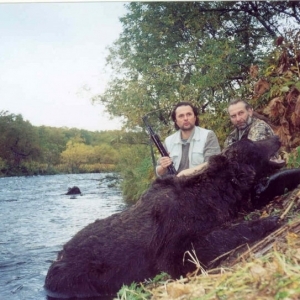 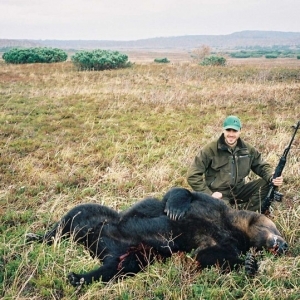 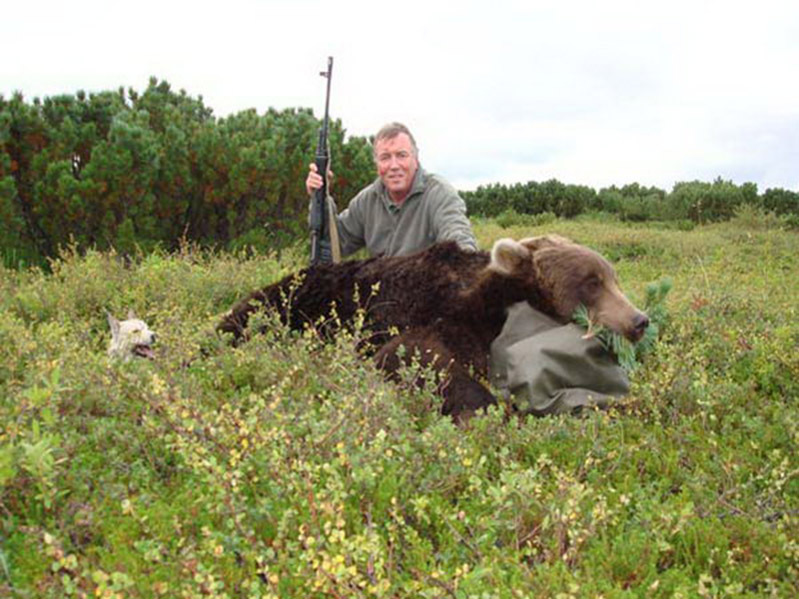 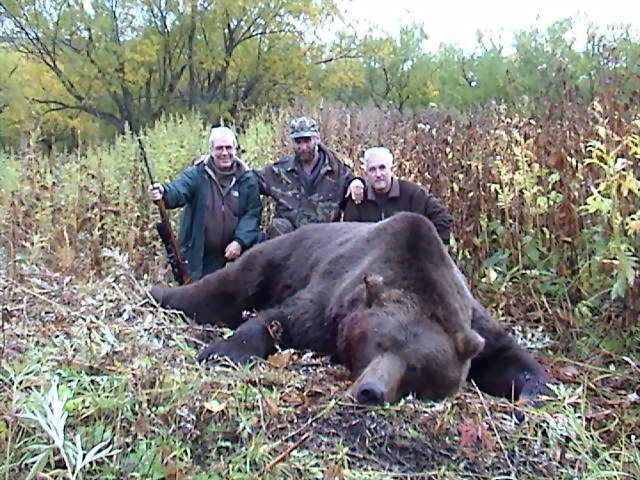 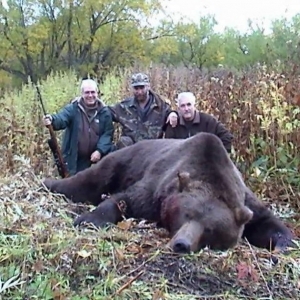 A trophy is considered a bear of three years old and older, weighing from 150 kg and more.It is prohibited to shoot any bears younger than three years old and females with cubs of any age. 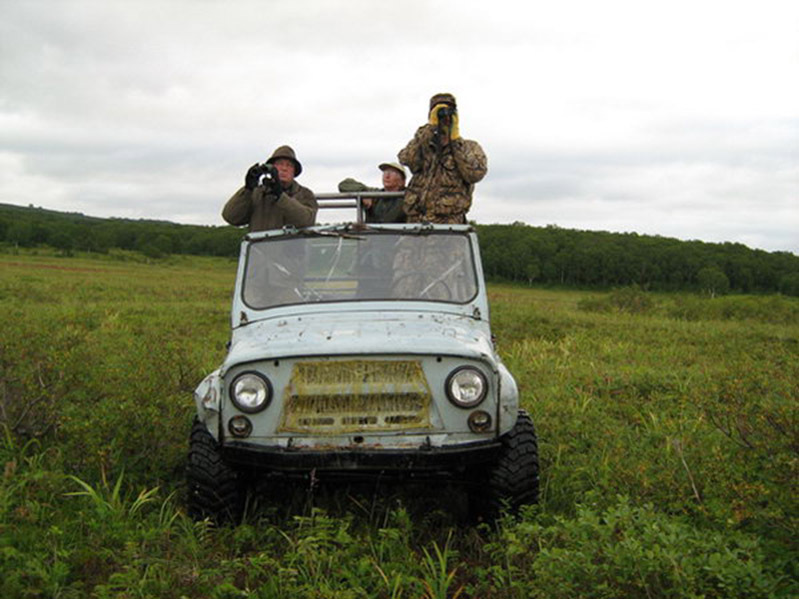 While going on the hunting ground on the above mentioned vehicles, the hunters find some bears with binoculars or merely by eye which might be feeding themselves or crossing tundra. 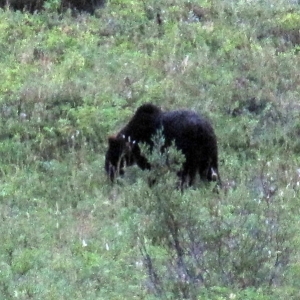 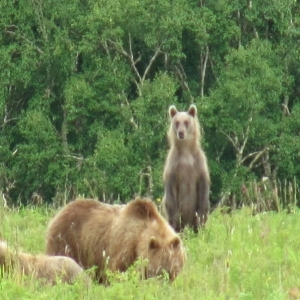 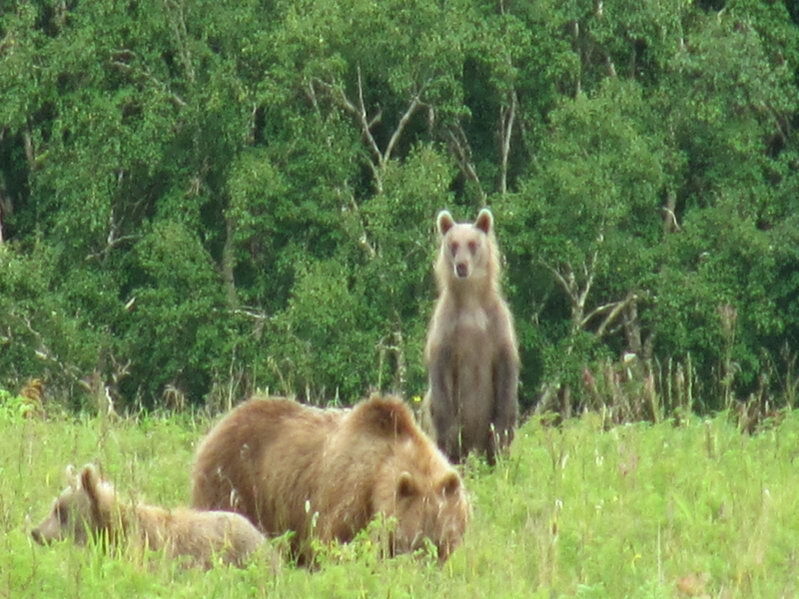 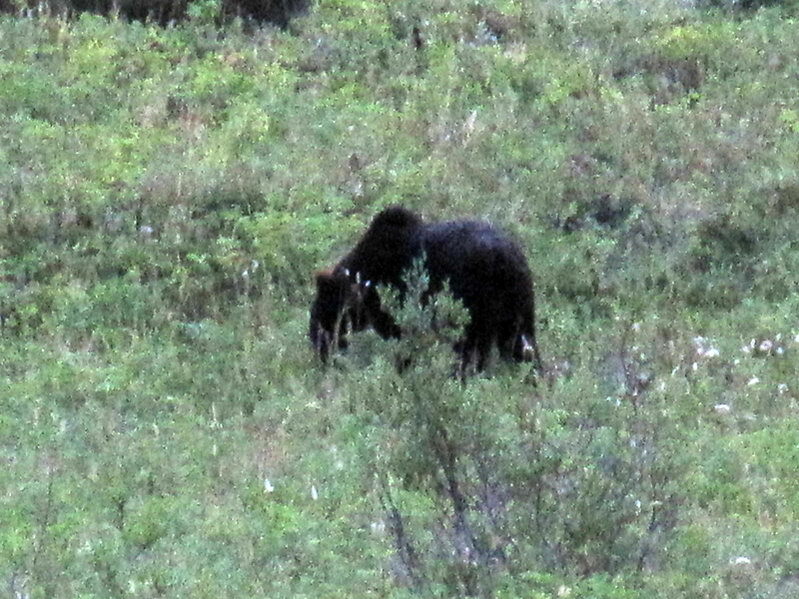 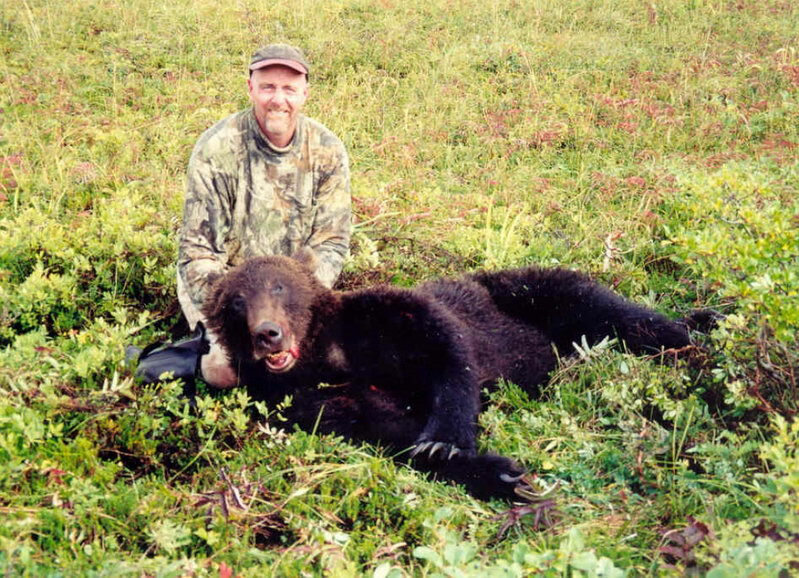 At this season bears are least cautious and allow hunters to approach rather close. 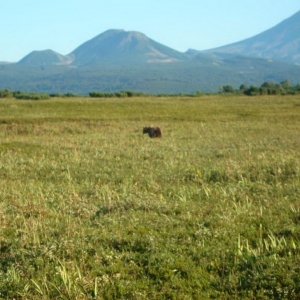 Shooting beasts from any vehicle is prohibited in Kamchatka Krai. 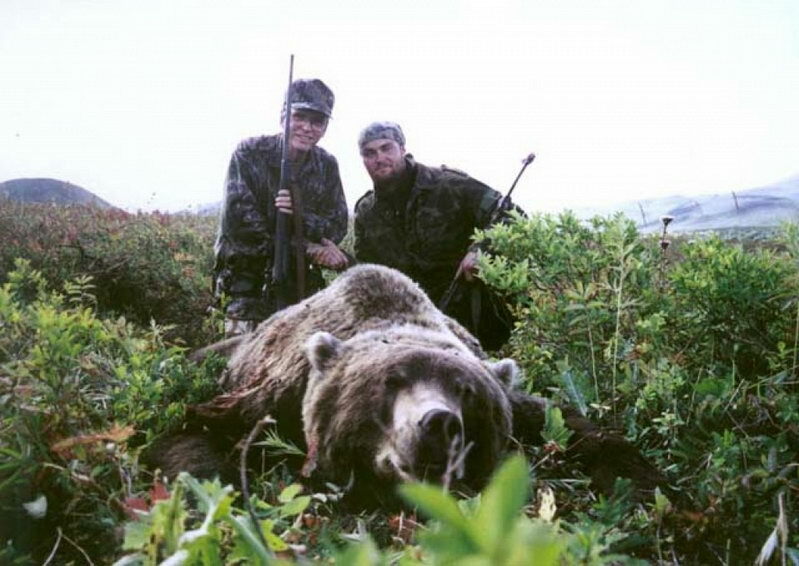 Having gotten out of a car and estimated the situation (wind direction, character of the terrain, and other conditions) – the hunter, accompanied with his guide, get as close to the animal as they can to guarantee an effective shot; it is desirable to have no more than 100 meters. 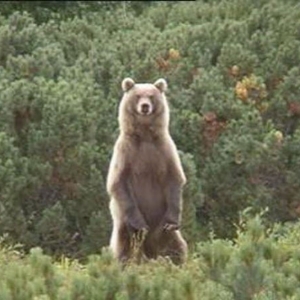 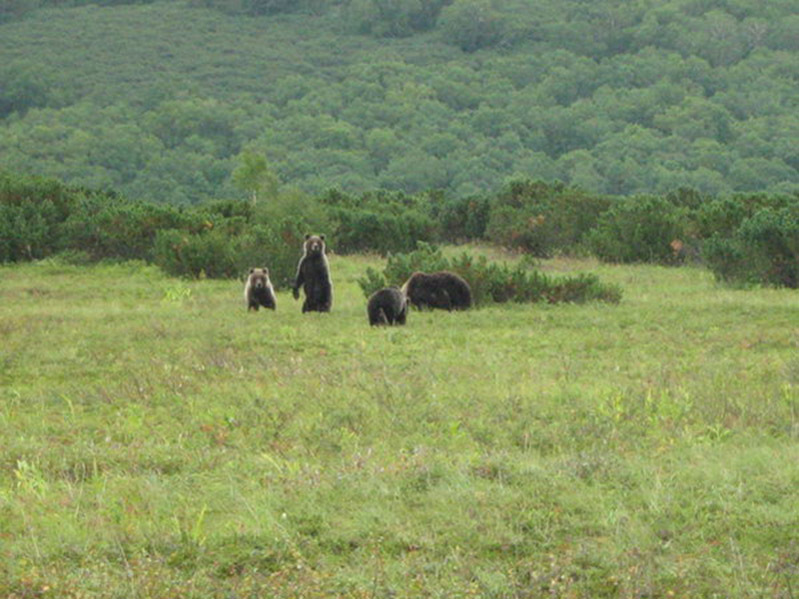 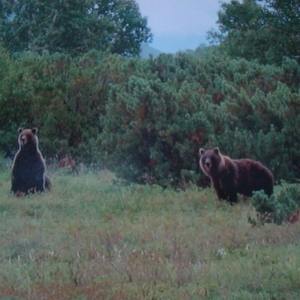 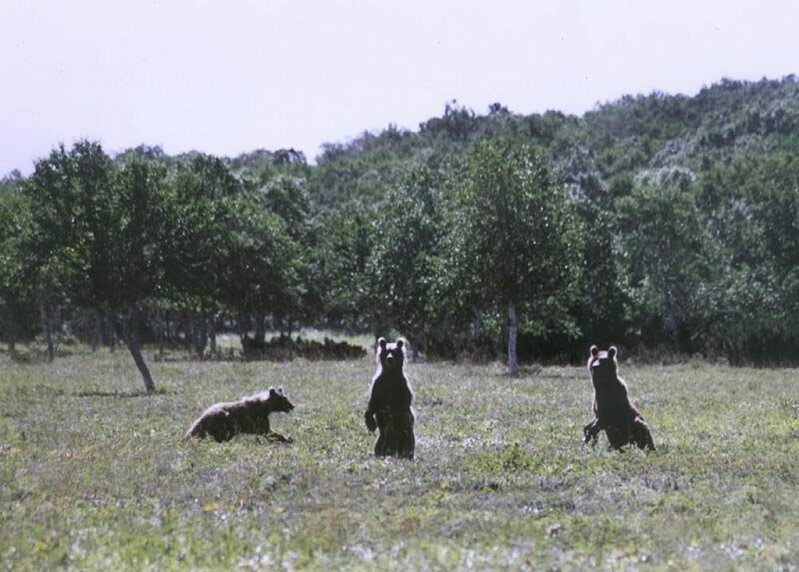 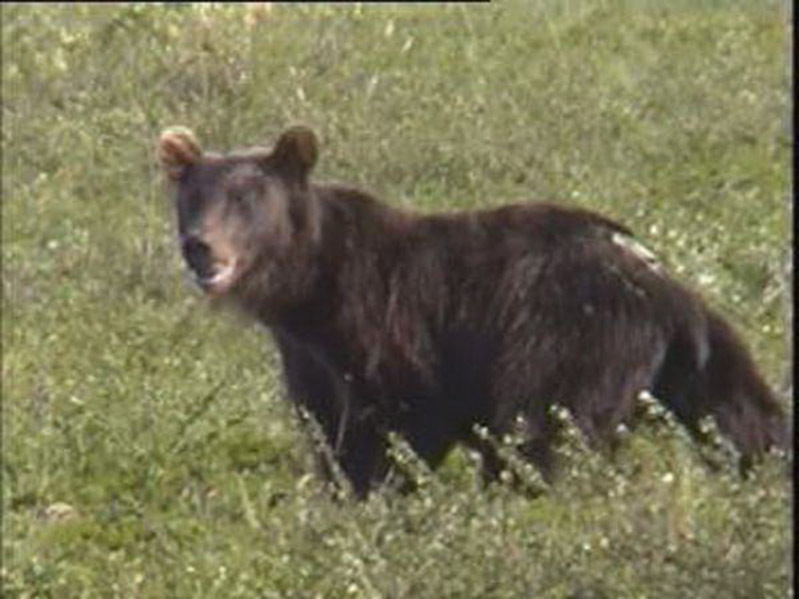 After approaching the mentioned distance or closer and taking up the convenient position for shooting (firm stand better), it is necessary to wait, if possible, for a bear to come into an open spot for the hunter to be able to shoot the escaping animal at least two-three more times in case the animal would not be immobilized after the first shot. 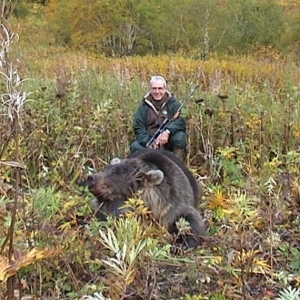 After he estimated trophy qualities of the bear, the guide gives the order and the hunter fires. 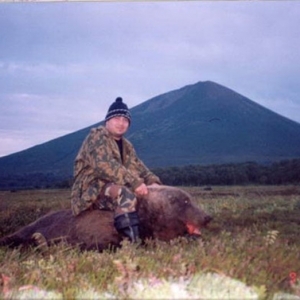 As a rule, the guide always secures his hunter with his rifle and shoots off a wounded animal if there is a probability of wounded game running off (in fall is it more possible for a wounded animal to escape then in spring). 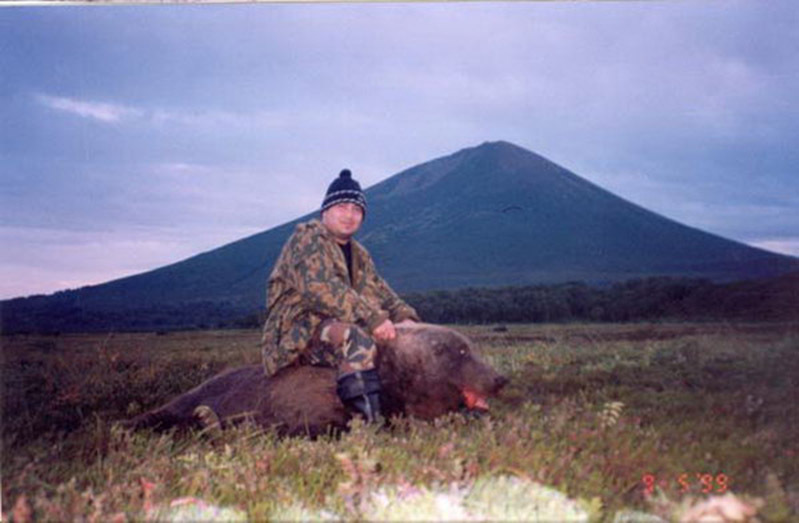 This term is always discussed with the hunter before starting a hunt. 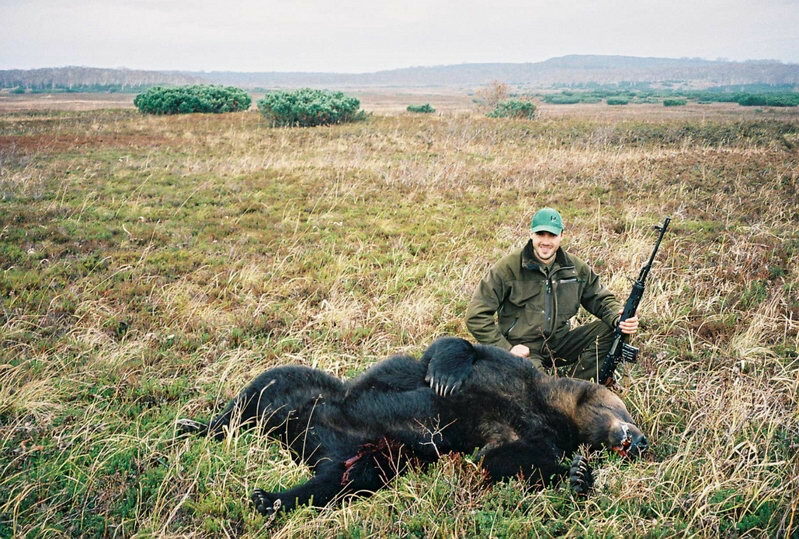 In case, the hunter refuses any guide’s assistance (relying on his skills only), searching and shooting off the wounded animal is carried out for additional fee and discussed in every particular case with guides depending on the nature of the hunting ground. 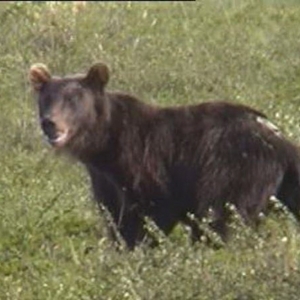 In heavy hunting conditions guides have right to reject searching of the wounded animal in order to avoid any accidents. 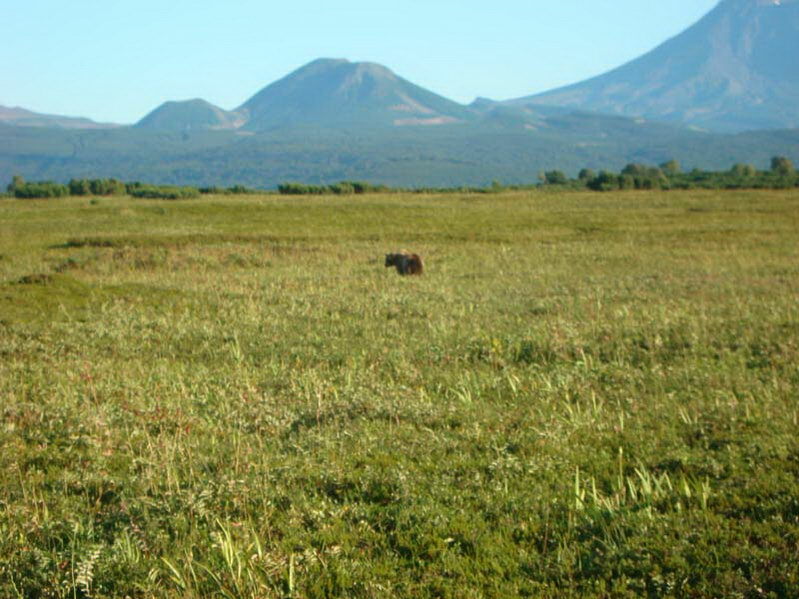 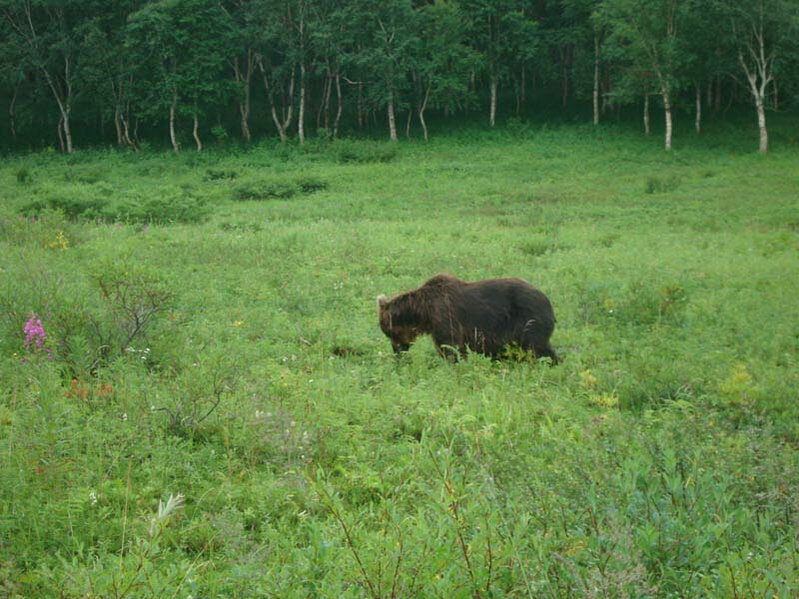 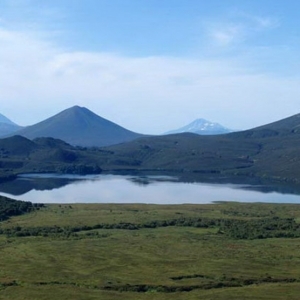 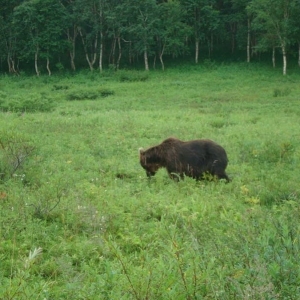 It is important to note, if within 48 hours the wounded animal is not found and shot off, according to the law about hunting in Kamchatka Krai, the license is closed and the tour is paid completely. 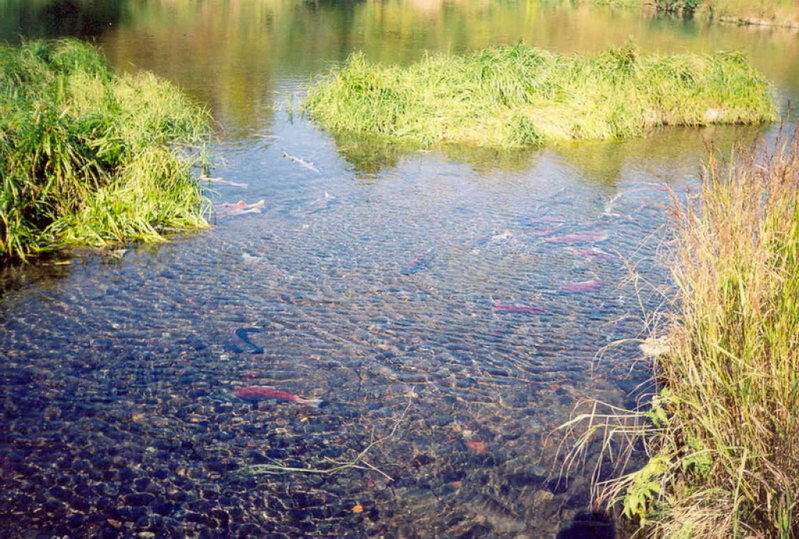 2.The second method – using baiting pads and salmon spawning grounds. 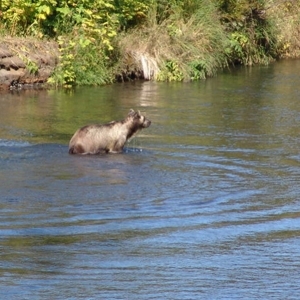 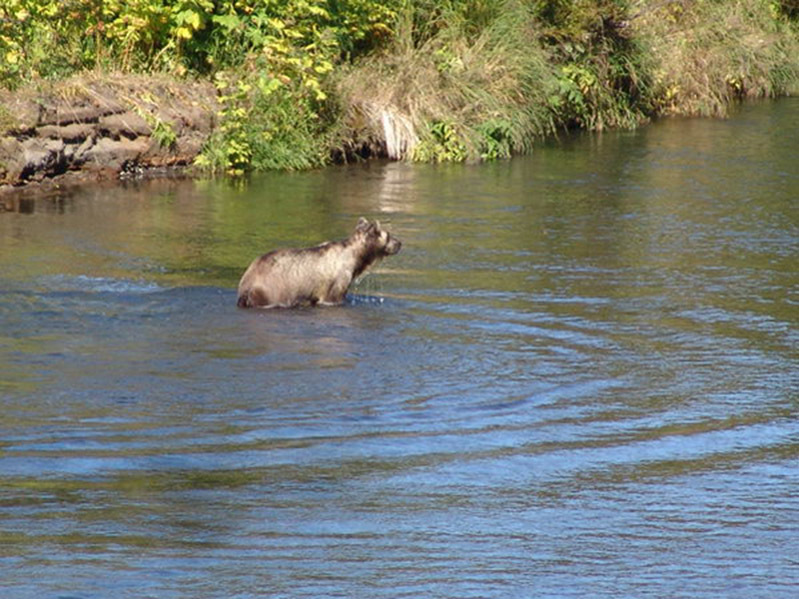 In fall up to December spawning of several species of salmon (Humpback, Red, Chum, Coho) occurs in Kamchatkan rivers and bears eat huge amounts of fish. 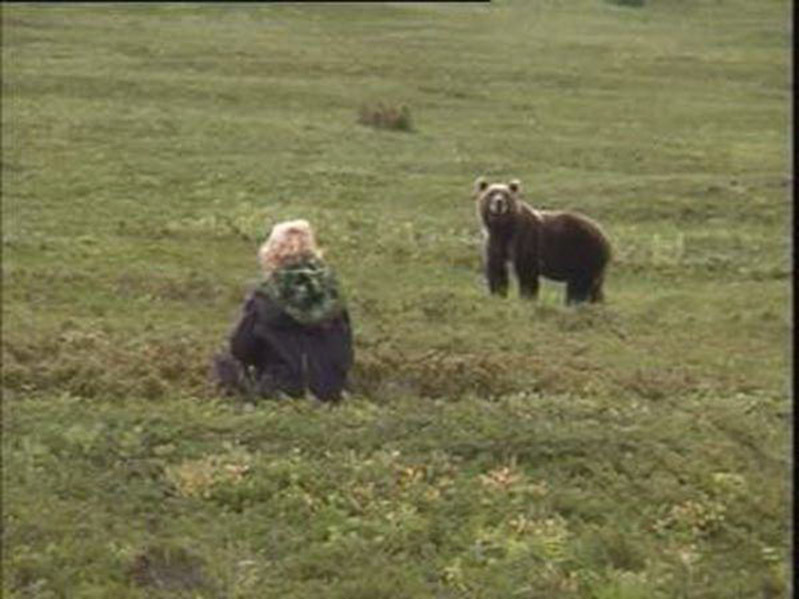 Before the season begins, guides prepare several stands putting some fish and a bear starts to come and feed. 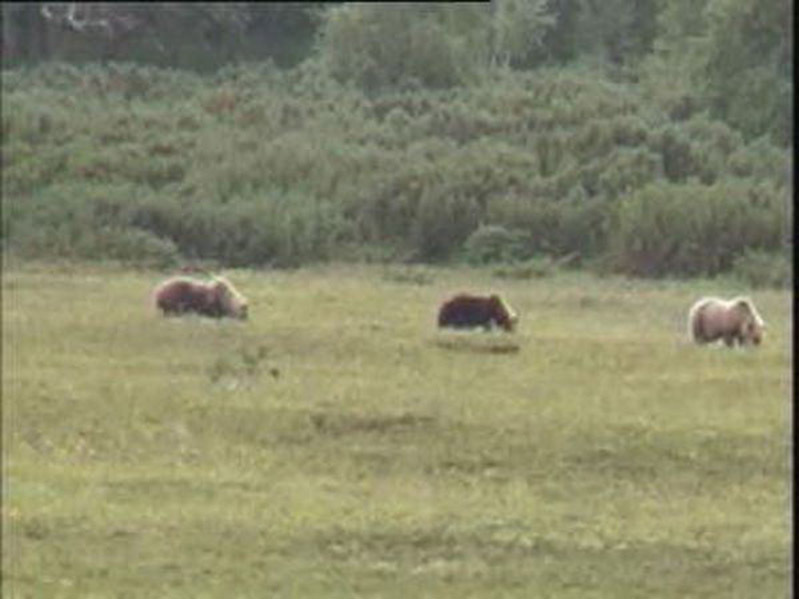 Usually the animal visits such places in the evening or at night time. 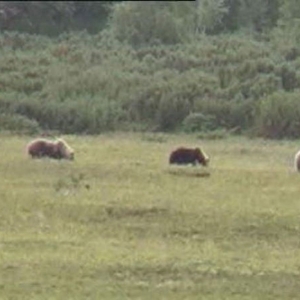 As a rule, one hunter and his guide go to such a hunt. 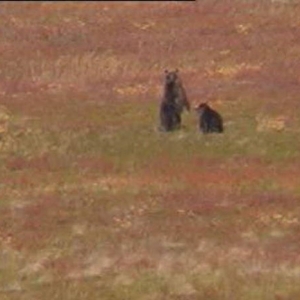 The hunter, accompanied by his guide, arrives to the site before 5 pm and depending of wind direction they choose a stand. 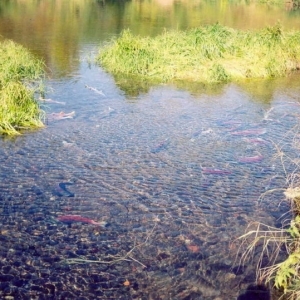 Everything is done the same way on the spawning ground. 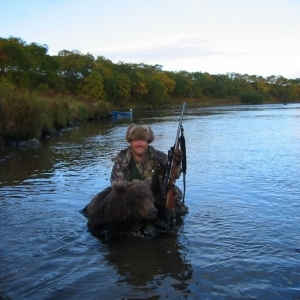 They try to choose stands on elevations for the river to be perfectly watched and hunters’ scent faded quickly. 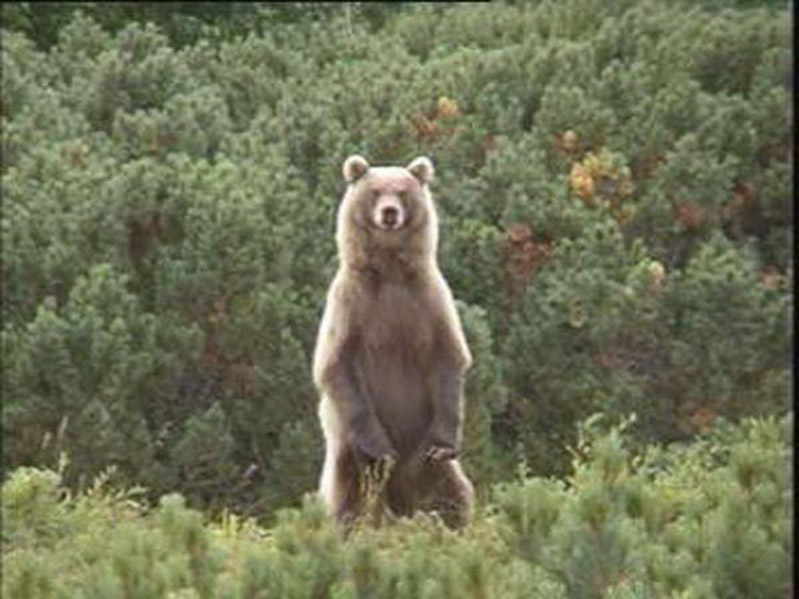 It is important to sit quietly, without talking and smoking. 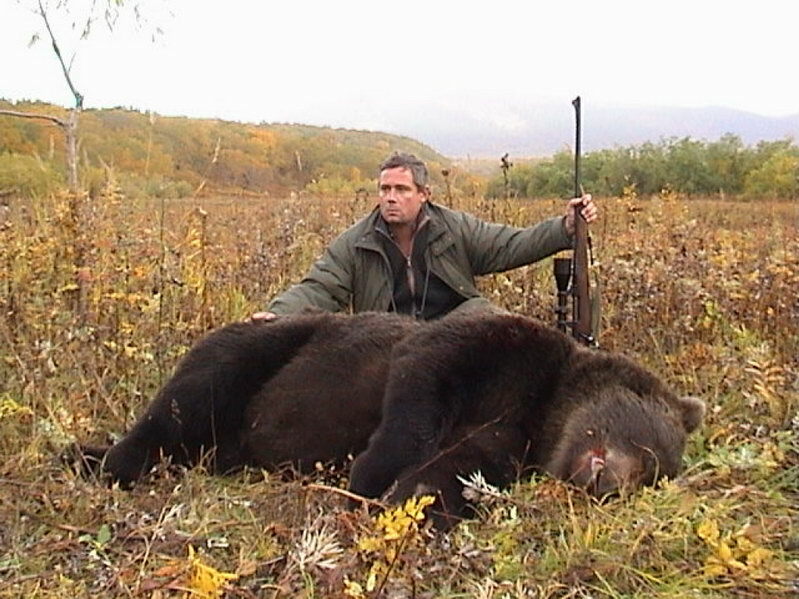 When a bear arrives and is estimated regarding its trophy qualities, a hunter fires the bear at his guide’s command. 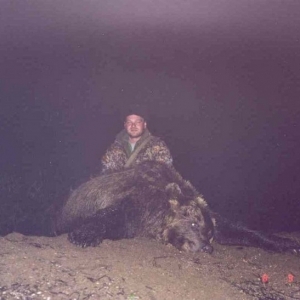 During night hunting it is very important not to miss the animal because there is likelihood that no second shoot would be possible. 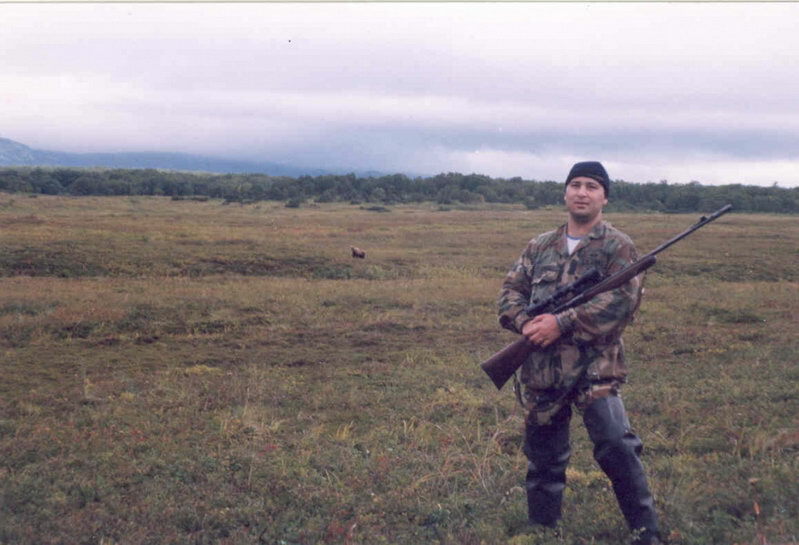 The guide also secures his hunter with his rifle. 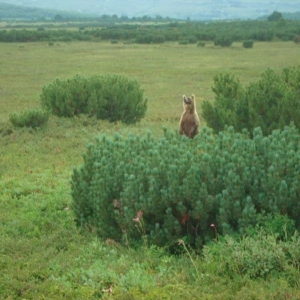 During the hours of darkness powerful lanterns are used. 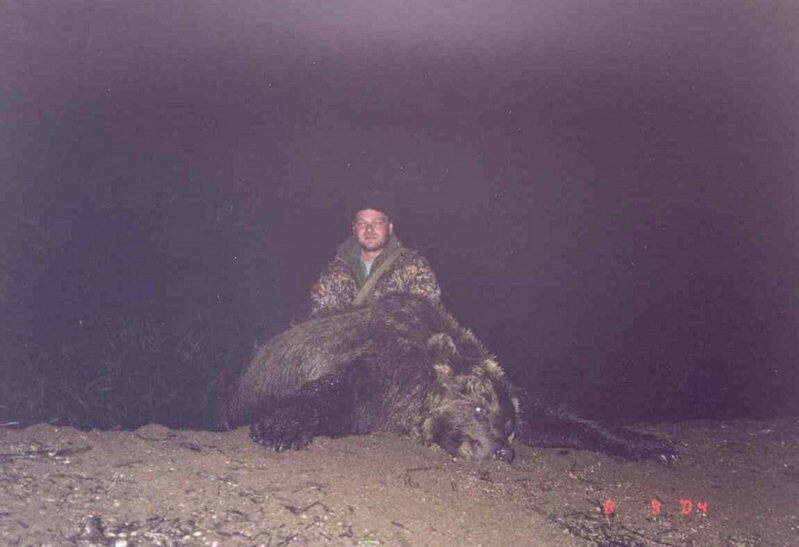 If a hunter comes with his own firearms, it is desirable to bring a night vision sight. 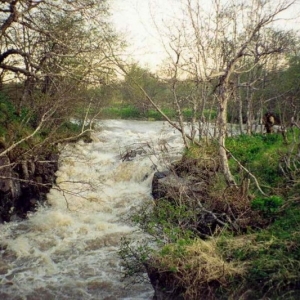 3.The third method is hunting while rafting down the spawning river. 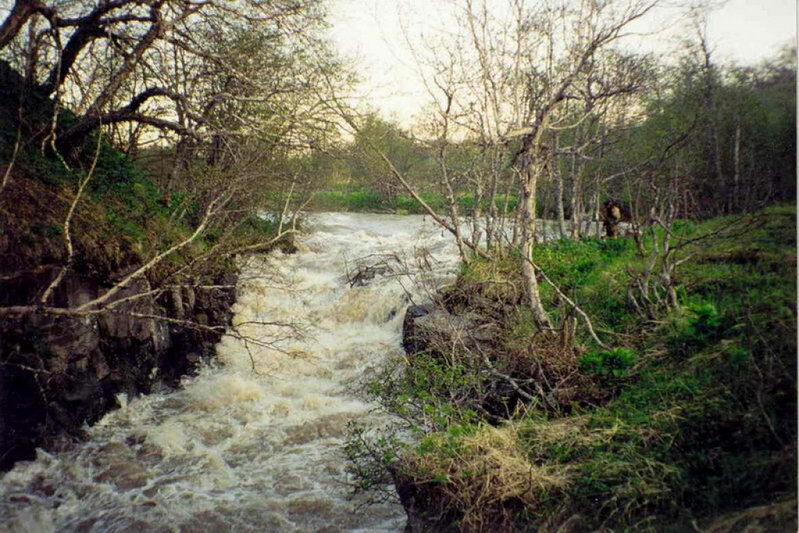 Various types of boats are used for rafting, but it is preferable to use rubber boats because they make less noise. 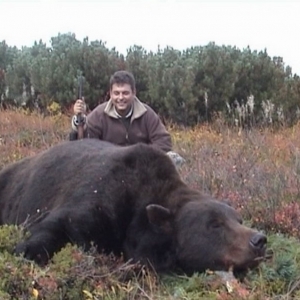 This kind of hunting is carried out also at evening time before it gets dark, at night and early in the morning. 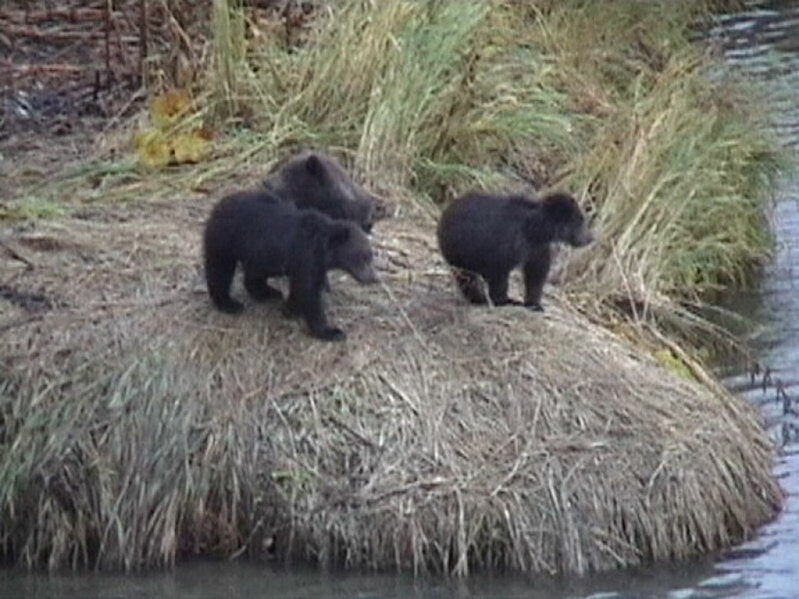 Usually two hunters and one guide are in a boat, because there might be several bears on the river. After killing a bear and processing it, the hunters move into another spot, down the river, where some other animals may be found. 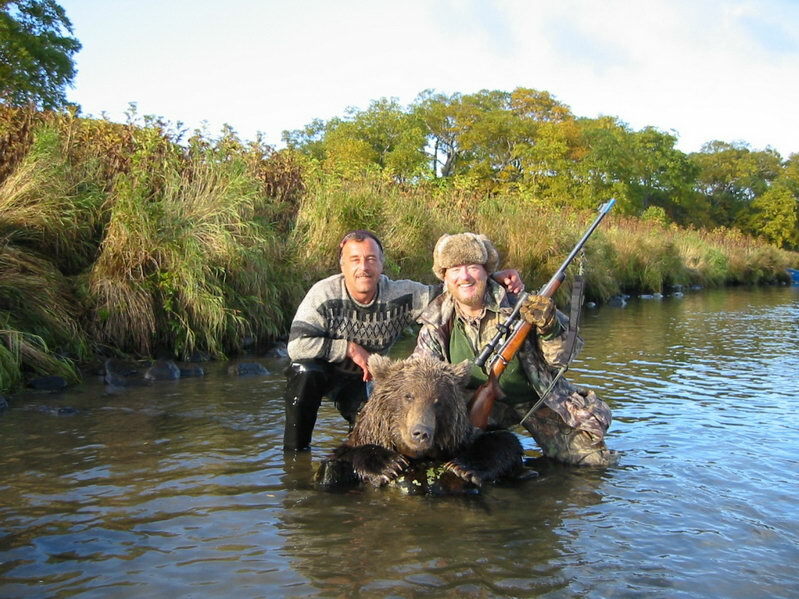 It is much more difficult to shoot a bear from a boat. 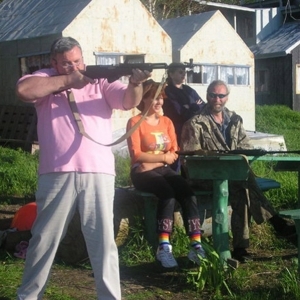 One has to possess some special skills and quick reaction. 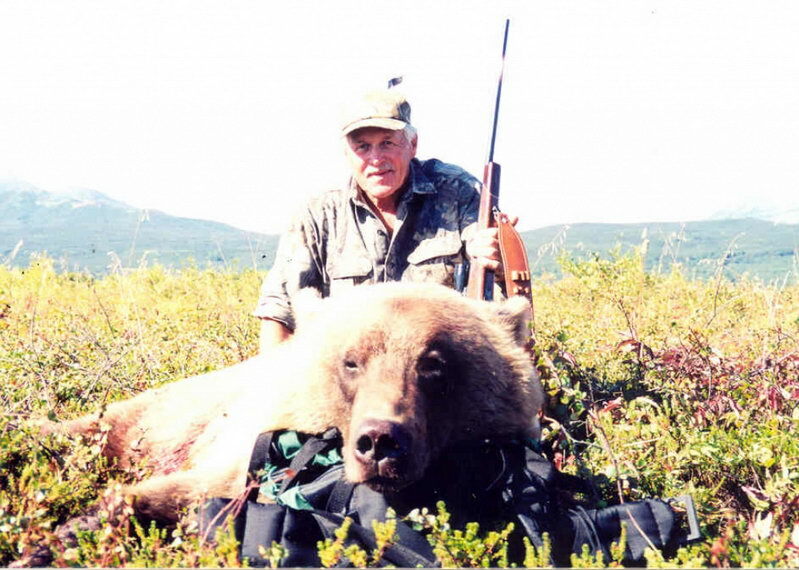 Having gotten his guide’s order – the hunter should aim as quickly as possible and take a shot. 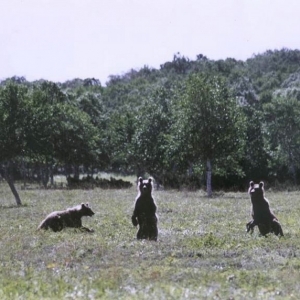 Prolonged aiming, as a rule, causes disappointing misses and wounded game escaping. 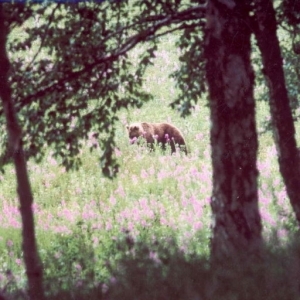 It is very difficult to track them in dense vegetation. 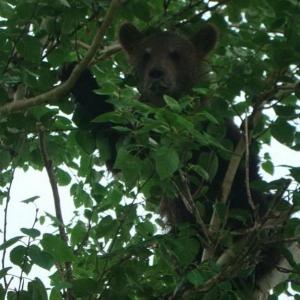 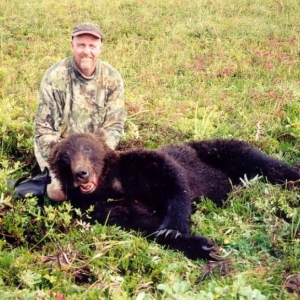 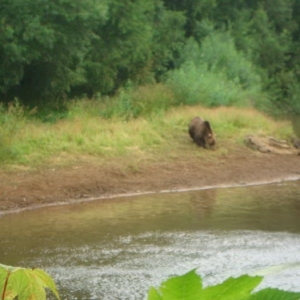 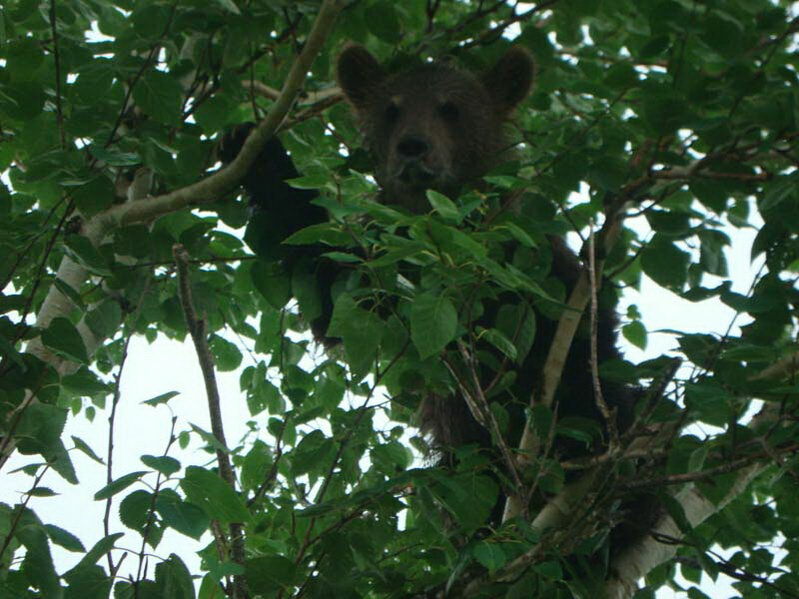 Tracking wounded bears at this season is very risky for life of both guides and hunters. 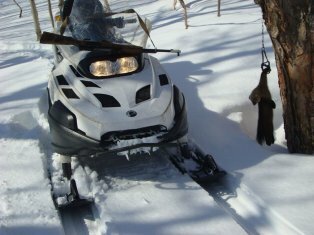 Air temperature at this season varies from 0 C or 32F (at night) and up to +20 C or 68 F (in the daytime). 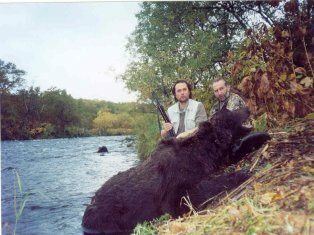 Bear hunting in autumn is really great!